Dr. Lynch is a Board Certified Plastic surgeon practicing in Chevy Chase, Maryland serving the Washington Metropolitan area. With 18 years of experience in private practice devoted solely to cosmetic plastic surgery, Dr. Lynch offers the expertise and credentials you can trust. 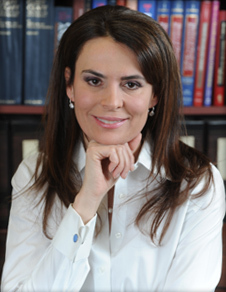 After completing her training in General Surgery and Plastic and Reconstructive Surgery at Brown University, Dr. Lynch completed specialty fellowship training in Cosmetic and Breast Surgery at Georgetown University where she is presently a Clinical Instructor. Her particular interests are in breast surgery,including breast augmentation, reduction and lifts; facial rejuvenation, including minimal incision facelifts, endoscopic brow lifts and neck rejuvenation; and body contouring, including liposuction, tummy tucks, medial and lateral thigh lifts and arm lifts. Dr. Lynch offers a full line of skin care products, aesthetic services and Laser procedures. Procedures such as rhinoplasty, otoplasty (ear pinning), and chin and cheek augmentation with implants and fillers are among the other surgical procedures offered (see home page). Dr. Lynch has taken a special interest in cosmetic surgery and has written chapters in the plastic surgery text Plastic Surgery Secrets on Chemical Peel and Dermabrasion. Her work with Reversed Abdominoplasty (Tummy Tuck) with autologous (your own tissue) breast augmentation was presented in Taormina, Italy, Istanbul, Turkey, and Newport, Rhode Island. Dr. Lynch, a Maryland native, received her Bachelor of Science degree from the University of Maryland, College Park, in Microbiology/Biology. She subsequently received her Masters Degree in Anatomy from the University of Maryland at Baltimore. She was inducted into both Phi Sigma and Beta Beta National Biological Honor Societies. Her Doctorate of Medicine was received form Eastern Virginia Medial School, where she was inducted in Alpha Omega Alpha Honor Medical Society. While completing her residency training at Brown University, Dr. Lynch studied craniofacial surgery in the Australian Craniofacial Unit in Adelaide, Australia. She also trained in Boston studying congenital hand surgery and in Miami studying facial rejuvenation (facelifts, brow lifts, chemical peels and skin care). In her final year of training at Brown, she served as Chief Resident in the Department of Surgery, Division of Plastic Surgery at Rhode Island Hospital. Dr. Lynch completed her training at Georgetown University in a fellowship program focusing on breast and cosmetic surgery. During her plastic surgery residency training, Dr. Lynch also conducted research on the treatment of malignant melanoma, a type of skin cancer, and presented her work at the Plastic Surgery Research Council in Galveston, Texas and at the Annual Meeting of the New England Society of Plastic and Reconstructive Surgeons in Woodstock, Vermont. The Plastic Surgery Education Foundation awarded her melanoma research with Best Research Paper at the Senior Residents’ Conference held in Birmingham, Alabama. Dr. Lynch has worked as a volunteer on medical missions in Kenya, Africa with Operation Smile International and in the Dominican Republic with Operation Luz del Sol. Dr. Lynch lives in Chevy Chase, Maryland with her husband, Tom Hogan, Washington attorney/lobbyist, and two children, Mary Kate and Elle. Dr. Lynch is a board-certified plastic surgeon that specializes in abdominoplasty, arm plastic surgery, bariatric surgery, Botox, Brazilian buttlift, breast augmentation, breast lift, breast reduction, brow lift, eyelid lift, facelift, fillers, Male body contouring, neck lift, otoplasty, rhinoplasty, thigh lift, tummy tuck, and liposuction. She services patients in Washington DC, Chevy Chase, Bethesda and surrounding Maryland in addition to the eastern shore of Maryland and Delaware from her office in Easton Maryland.